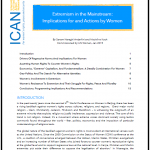 This paper provides a brief overview and analysis of the causes, manifestations and consequences of rising conservatism and extremism, particularly religious extremism and its implications for women. It reflects on how and why women may be drawn to the ideologies and movements that spread extremism and provides insight on the global women’s rights movement’s activism and resistance to emerging threats. The paper offers recommendations for action by the international community.